During Ramadan lanterns and lamps of various kinds, hues and degrees of brightness are often strung in homes and businesses. Today, 29 June 2014, marks the first day of the Islamic holy month of Ramadan, which is the most important time of the year for Muslims worldwide. 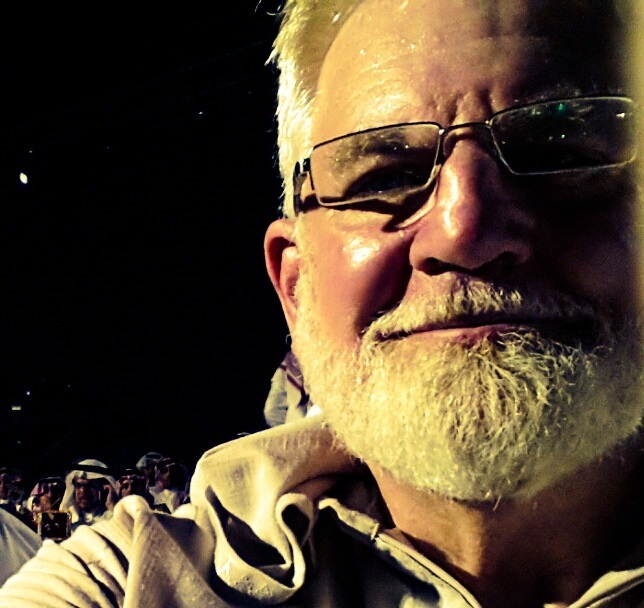 This is my third year to join in the celebration of Ramadan in the Kingdom of Saudi Arabia, having moved to Jeddah in December 2011. Ramadan is viewed by children as a wonderfully magical time. Neighborhood houses and businesses are often adorned with strings of colored, lighted lanterns. During Ramadan lanterns and lamps of various kinds, hues and degrees of brightness are often strung in homes and businesses. Many stories of their origins have been told. One legend has it that the Fatimid Caliph Al Hakim Bi-Amr Illah wanted to light the streets of Cairo during Ramadan nights, so he ordered all the sheikhs of mosques to hang Fawanees that could be illuminated by candles. As a result, the Fanoos became a custom that has never been abandoned. Homes seem to be perfumed constantly with the mixed smells of food and burning incense—all serving as a constant reminder that this month is a very special time of the year. The uninterrupted chanting of Qur’an verses emanating from nearby mosques indicate the absolute solemnity of Ramadan. It is an intrinsically sacred time for all Muslims. It was during the month of Ramadan that the first revelations of the holy Qur’an were first revealed to the Prophet Mohammed by the Archangel Gabriel. The Qur’an is the holy book of Muslims, being recited daily year-round through prayers and worship. It is the basis for reflection in guiding the lives of Muslim men, women and children. During Ramadan, Muslims will fast and engage in extra prayers and worship, as a means of drawing nearer to God. Ramadan is the ninth Islamic month. The Islamic calendar is based on a lunar calendar, and the lunar calendar which is 10 days shorter than the Gregorian calendar. It, therefore, takes 30 years for the calendar to rotate full cycle. Fasting and prayer are from dawn to dusk during Ramadan, which presents greater challenges to Muslims living in the far northern regions where they are expected to stick to the rules, no matter how long the fasting period may be. Fasting in northern Canada or the Nordic states of Norway, Sweden, and Finland is especially difficult, but the blessings of fulfilling the fast are even greater. The Prophet Muhammad taught that “whoever does not give up lying or cursing during Ramadan, God has no need for that person to give up his food or drink” – which emphasizes that Ramadan is not just about avoiding food or drink, but also working on who one purports to be as a person. As a spiritual support to achieve one’s goal, Muslims will attend their mosques more often. In the evenings there will be a special extended prayer time. 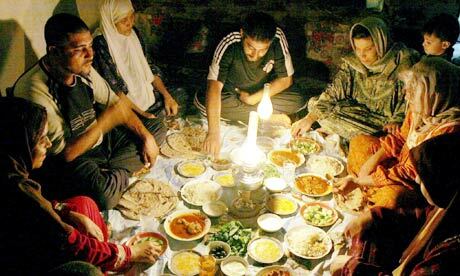 A Muslim family breaks the fast at sundown with Iftar. Ramadan is known as the “month of empathy.” Ramadan is an exercise in empathy for the more than 2 billion people in the world who live in poverty, but it’s also a lesson in gratitude. During this 30-day period Muslims put themselves in the shoes of people who are in dire straits—people who are suffering deprivation of all kinds: thirst, hunger, homelessness, sickness, pain, etc. This month at Tuqwa Mosque in Jeddah, Saudi Arabia, as in all mosques around the world, the brothers and sisters gather five times a day for prayer, fellowship and encouragement while reflecting on the needs of others in their community and worldwide. Collections are made for the poor. Individuals are encouraged to carry out distributions to the poor. It is common to find men, women and children on street corners distributing dates and water to passersby at sundown for the breaking of the fast. 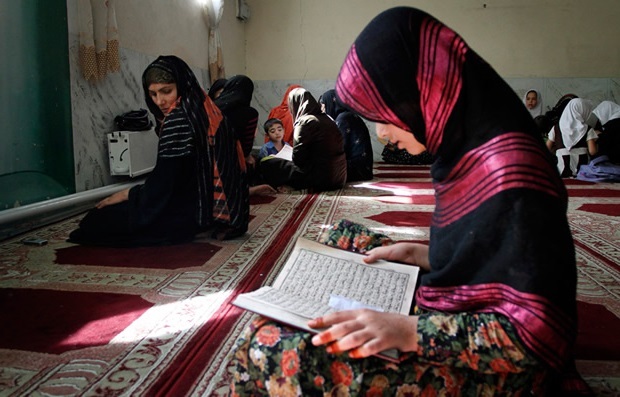 Men and women seek to draw closer to God through increased prayer times and reading the Qur’an. Along with learning and practicing empathy towards others, one is to learn patience. For 30 consecutive days the faithful are put into a situation where they will face are going to be hungry, sugar levels are low, and the chances are that one is going to get a bit edgy and agitated, so either one develops a rather foul mood for the month of Ramadan or one deals with it successfully for 30 days. Muslims are advised to control and deny anger. If one feels anger rising within, one is encouraged to take refuge in God. The Prophet Mohammed (PBUH) said, “If a man gets angry and says, ‘I seek refuge with God from the accursed Satan,’ his anger will go away.” Saying this, Muslims believe, will make it easier to control your anger, as it will remind you that it’s being increased by Satan’s whisperings and that he is rubbing his hands with glee at your rising temper! Standing makes one feel strong, agressive and powerful and ready for fight. So if one gets angry while standing one is directed to follow the Prophet’s advice: “When one of you becomes angry while standing, he should sit down. If the anger leaves him, well and good; otherwise he should lie down” (Abu Dawud and Al Tirmidhi). Noor Khan helps load food bags for different Canadian charities. The food and cash donations were collected by the local Windsor, Ontario, Muslim community. All the Abrahamic faiths (Judaism, Christianity and Islam) teach that there will most definitely be a final day when all humankind will stand before God in Judgment. Jesus spoke of the Judgment Day when he walked among men. He said “Every idle word that men shall speak, they shall give account thereof in the day of’ Judgment” (Matthew 12:36). We’re told in Hadith Jibra’il, that one is: “…to worship God as though you are seeing Him, and while you see Him not yet—truly He sees you” (Al-Bukhari). Such God-consciousness (tuqwa) is a good practice for all who claim to believe in the God of Abraham! One should strive to live each moment, fully aware of God’s presence, living in the knowledge that He is watching everything done by humankind—that someday there will be an accounting for one’s behavior here on earth. 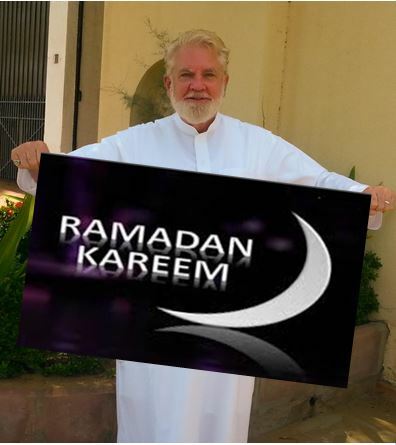 Ramadan is a great time to demonstrate repentance, seeking renewal in one’s relationship with God, to gain forgiveness and peace through increased reverence and worship and to prepare oneself for that final, great Judgment Day. A firm faith in God is the beginning of that journey—but it must be proved that it is a genuine faith that leads to changed behavior while reflecting on the needs of others and exercising self-restraint; engendering greater love, dedication and service to our almighty God. Ramadan ends with the festival Eid al Fitr, which in 2014 occurs on July 28. Literally the “Festival of Breaking the Fast,” Eid al Fitr is one of the two most important Islamic celebrations (the other occurs after the Hajj, or pilgrimage to Mecca). At Eid al Fitr people dress in their finest clothes, adorn their homes with lights and decorations, give treats to children, and enjoy visits with friends and family. A sense of generosity and gratitude colors these festivities. Although charity and good deeds are always important in Islam, they have special significance at the end of Ramadan. 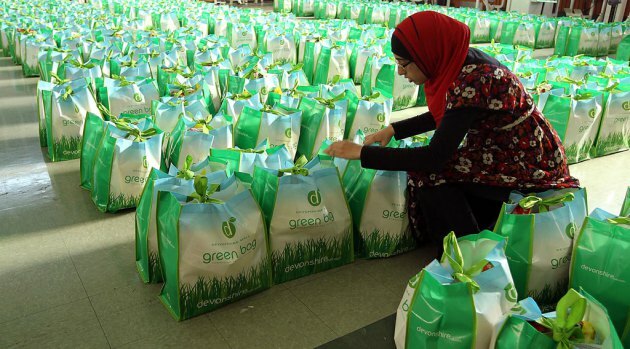 As the month draws to a close, Muslims are obligated to share their blessings by feeding the poor and making contributions to mosques and community nonprofit organizations. The Red Sea’s colorful coral reefs are home to some of the world’s most amazing species of aquatic life. Yesterday I had the wonderful experience of accompanying some Saudi friends on a snorkeling adventure into the Red Sea, about 90 kilometers south of Jeddah, Saudi Arabia. My previous experience of exploring coral reefs had been in snorkeling around Virgin Gorda in the British Virgin Islands and scuba diving off the Gulf coasts of Belize and Mexico. 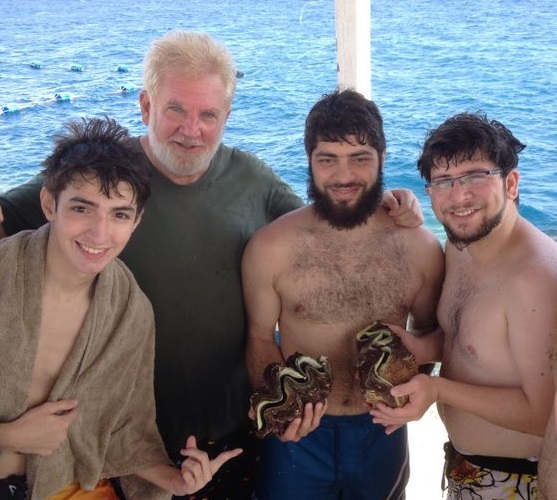 However, what I witnessed beneath the waters of the Red Sea was equally incredible. The Red Sea coral reefs are among the most beautiful of all the world’s marine habitats. This vast inlet of the Indian Ocean provides ideal conditions for corals and other countless forms of aquatic life. There are about 200 species of “stony corals” along the coast. Most corals are reef builders. Each of these sea polyps builds a skeleton and the animal sits in a calcareous cup that it has secreted. The polyps are connected to each other by an extension of the body above the level of the skeleton. Thus the colony sits on the surface of the skeleton, feeding on algae and particles of food drifting along in the water. In deeper waters there are such species as hammerhead sharks and barracudas and various varieties of jellyfishes which look attractive but can deliver their unpleasant stings. 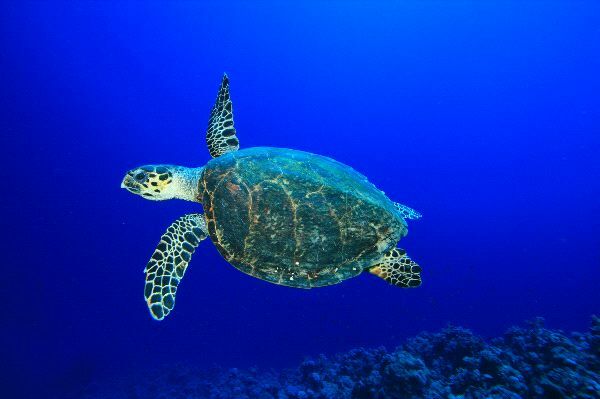 Red Sea Hawksbill turtles are on the decline due to degradation of nesting habitats. I am told that Jacques Cousteau chose this celebrated Red Sea reef system to first introduce the world to undersea life, and by the same token it is not by chance that so many people become diving and snorkeling fanatics during their visits to Saudi Arabia. The exceptional richness of marine life in the Red Sea is due to an unusual combination of environmental factors. First, the Red Sea is comparatively sheltered and calm: its currents are gentle and regular, its tides almost non-existent, and its temperature warm and steady. While its waters run quite deep, they are warmed by volcanic heat emanating from the sea bed. The result of all these factors is an environment ideally suited to the complex and delicate ecosystem of coral reefs. Considering all the world’s most celebrated reef systems, these of the Red Sea stand out for their unusual wealth of specific kinds of marine life–most notably, coral itself. The sheer abundance of corals, many of exceptional size and color, makes diving and snorkeling in the Red Sea an experience of almost magical intensity. Today, one-third of shallow water, reef-building species are threatened with extinction, making them one of the most endangered animal groups on the planet. These reefs are suffering from many environmental impacts, including the effects of climate change, pollution, over-fishing of animals that live on the reefs, and removal of the reefs for use as home décor objects and curio and aquarium trade. 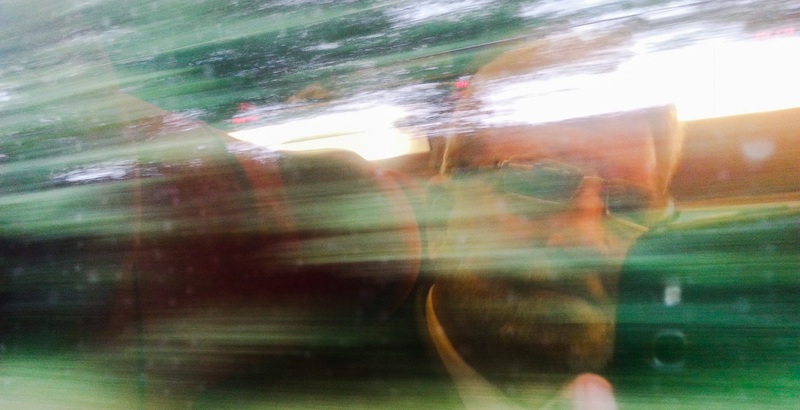 Sam’s reflection in the window of the Thalys high-speed train he took from The Netherlands to France. As a high school student at Bob Jones Academy and later as a student at Shelton College, I had worked in Europe for four summers with the Evangelical Reformed Church and other Christian groups. So it was at the age of 18 I found myself bagging groceries, waiting tables in restaurants and scrubbing dormitory toilets in what would be an ongoing effort at getting airline tickets to Europe. As a young student of history, at the end of each summer of work I would take off on my own–travelling to see different parts of Europe. I got around by a Eurail Pass for trains or just hitchhiking on the German autobahns. I have, on occasion through the years, returned to Europe, and it has been interesting to see changes gradually taking place throughout—especially Central and Eastern Europe after the fall of communism. 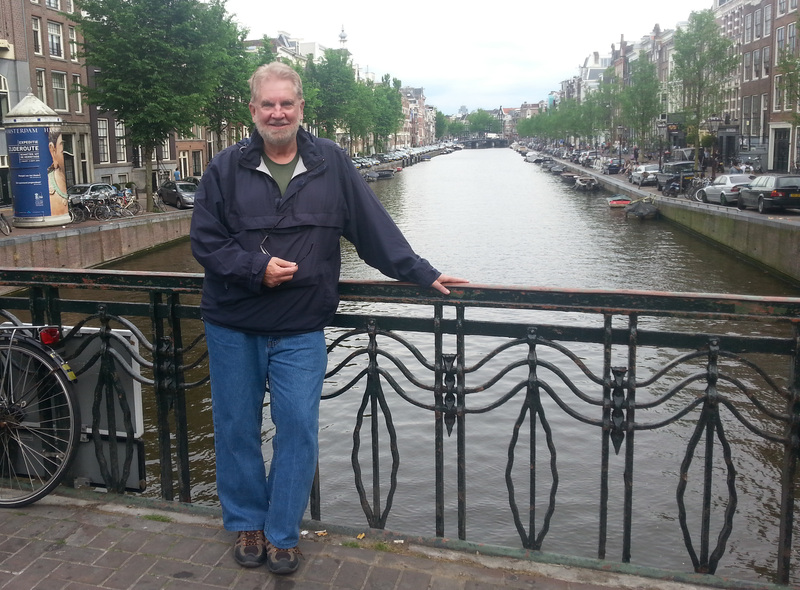 Now I was invited by a businessman from Jeddah, Saudi Arabia, to accompany him on a brief 8-day business trip to Amsterdam and Paris, and I got to have some time off in both cities to explore sights I had first seen some 48 years ago! Amsterdam is considered the “greatest planned city of northern Europe.” It has always been a well-known name in world history and played a central role in the history of the Netherlands. In the 17th century Amsterdam was the center of world economy, and nowadays the city is known for its more tolerant character. The period 1813-1940 is marked by economic recovery and, from 1870 onwards, by expansion. The increasing wealth brought about a rapid population growth. This development was primarily the result of the Industrial Revolution which triggered off a New Golden Age. The city now ventured into the area beyond the Singelgracht. Large poorly built working-class neighbourhoods were built. The period 1920-1940 was a time of economic recession. Therefore it is all the more remarkable that the so-called Ring 20-40 compares favourably to the 19th century jerry-building. This was also the period of large-scale damage to the historical city centre; canals were filled in and new traffic breakthroughs were realised. After concluding business in the Netherlands, I boarded the hi-speed Thalys train from The Netherlands to Paris, France. The train ride, at nearly 300 kilometers per hour, would take a mere two-and-a-half hours compared to the 10 hours it used to take to get from Amsterdam to Paris! 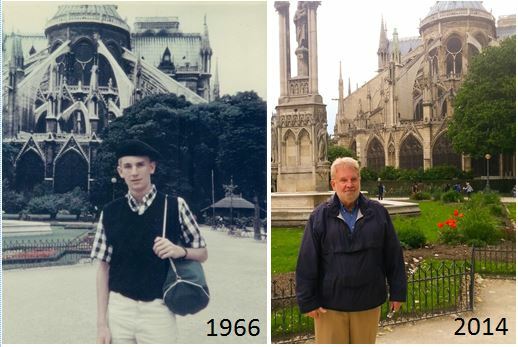 Sam stood behind Notre Dame Cathedral some 48 years after he first visited Paris! The history of Paris, France, spans more than 10,000 years! During that time the city grew from a small mesolithic settlement to the France’s largest city and capital. Through the centuries Paris developed into a center of government, art, medicine, science, fashion, tourism, high culture and high finance, becoming one of the world’s most influential global cities. Today, Paris is one of the major capitals of the world. While many world capitals feed off the energy of modernity, Paris is loved because it represents an escape from it. So when most people visit the city, their agenda involves visiting monuments like the Louvre, the Hôtel de Ville and Notre Dame Cathedral. The “baby” of this grand group is the Eiffel Tower, built in 1887. Certainly, no visit to the “City of Lights” can be completed without visiting the Eiffel Tower time and time again. It was constructed as the focal point of the 1889 Paris Exhibition which highlighted the science and engineering achievements of the 19th century. Soaring 300m / 984 ft. (320.75m / 1,052 ft. including antenna) and weighing 7000 tons, the structure consists of two visibly distinct parts: a base composed of a platform resting on four separate supports (called pylons or bents) and, above this, a slender tower created by the latticework tapering upward. Around its Grande Arche and esplanade (“le Parvis”), La Défense contains many of the Paris urban area’s tallest high-rises. Paris might very well be one of the most well-preserved cities in the world – but it still has a lot of contemporary ‘features’ to offer. This comes in the form of hip and modern buildings, museums and other architectural wonders which will give you an idea about what contemporary Paris is all about. 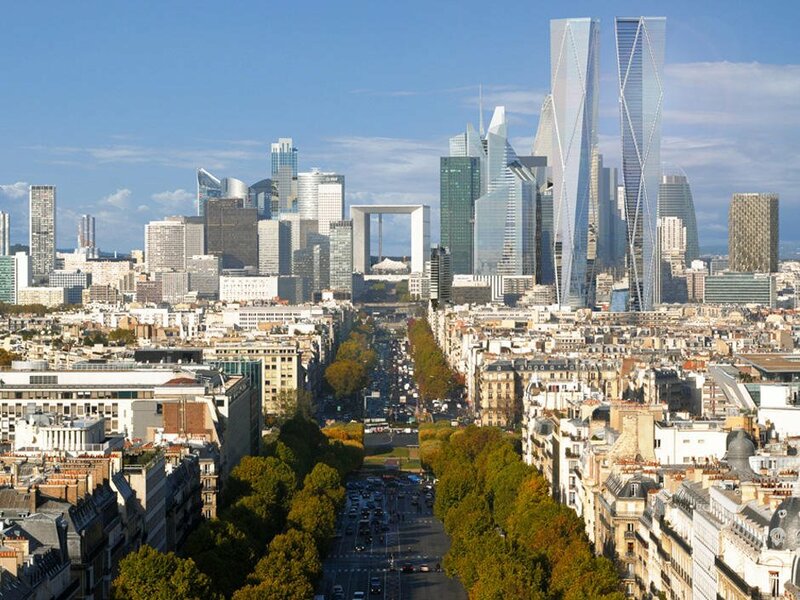 Among the more notable modern buildings of La Défense is the famed square, hollow Grande Arche. La Defense is also home to Pompidou Center’s Piano and Rogers Building, considered one of the emblematic buildings of the 20th Century. Sometimes compared by critics to an oil refinery, the building which houses modern art was the subject of huge controversy throughout the 1970s, but now has won the hearts of Parisians. I am grateful to have had this opportunity to visit these nations once again. Enjoy this video history and tour of Paris’s famous Eiffel Tower.